Tolire lake are placed in foot of Gamalama mountain. 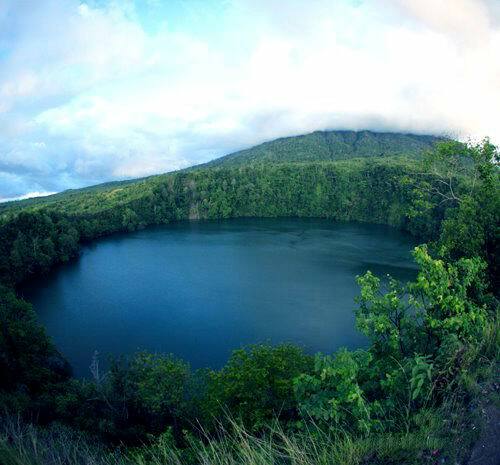 There are two lakes that included in Tolire lake, they are Big Tolire lake and Small Tolire lake. One each other are separated about 200 meter. Story about this lake started when there is a father that intimated to his daughter till the daughter get pregnant. Then both of them go far away from the community and when they were standing on a field suddenly the land was fall down and created two lakes, big lake that created by the father and small one that created by the girl. Big Tolire lake is the often object that more visited by both tourist, domestic and tourist that come from the other country. The attractiveness that can interest tourist attention is there are many magic and belief that in Big Tolire lake. The depth of this lake that unknown till today. It is 50 km under the side of the lake and this is 5 hectare in wide. It is guessed that the depth of lake is related with the sea. Big Tolire lake is the belief about Invisible Crocodile. No one can see this lake except people with clean hurt that can see this crocodile. There are many kind of fish that life in in it. Many people though that the crocodile that life in this lake just trick to forbid people in catching fish to keep lake object. But you will think for twice if you want try to catch fish in it as there is a foreign that swim and he never came back. He might caught by this crocodile. And than we can not throw stone until reach lake water. You will not stop throwing stones till you realize that the magic has cover this lake, this magic keep to not reach the lake.